Party Casino Review - Get 100% Deposit Bonus and 20 FREE Spins! PartyCasino was originally named Starluck Casino when it launched in 1997. The site was renamed PartyCasino in 2006 and it now one of GVC Holdings’ most successful brands. PartyCasino has earned and maintains an excellent reputation and new players are attracted to the site’s seemingly endless selection of games, bonuses, and ongoing offers. Online casino players who appreciate a diverse selection of games, good customer service, and hassle-free withdrawals will be pleased with what they will find at PartyCasino. The VIP program and cashback rewards add plenty of value to an already superior online gambling experience. Party Gaming merged with bwin Interactive Entertainment to form bwin.party Digital Entertainment in 2011. That entity was then acquired by GVC Holdings in 2016. GVC Holdings is licensed by the UK Gambling Commission, the Malta Gaming Authority, and several other jurisdictions like Austria, Italy, Denmark, Gibraltar, and even New Jersey. PartyCasino has earned eCOGRA’s Safe and Fair Seal of Approval and was named EGR’s Casino of the Year in 2018. PartyCasino has always been known for offering its players a variety of valuable bonuses. 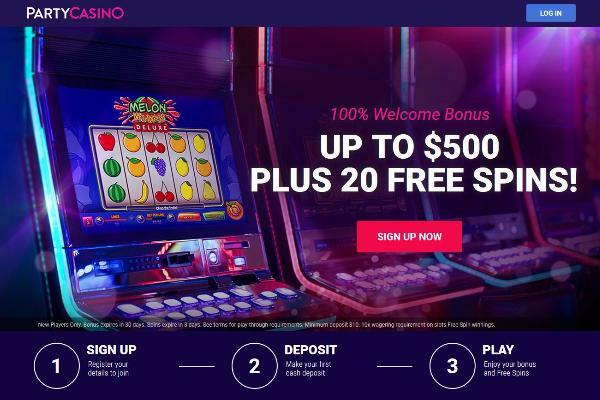 Players who open a new account and make a deposit are in for a real treat when they claim their 100% up to $500 Welcome Bonus which also comes with 20 free spins on the Melon Madness Deluxe jackpot slot. PartyCasino will 100% match your first deposit up to $200 and give you 20 free spins. Players can then claim a 100% match bonus up to $150 on their next two deposits. This bonus offer is only available to new players and a minimum deposit of $10 is required. You need to play through the bonus amount 35 times before the funds are eligible to be withdrawn and any winnings you accumulate from the free spins must be wagered 10 times. Deposits made using Neteller, Entropay, and Skrill do not qualify for this welcome bonus. Read the terms and conditions to find out more. UK residents who open a new account and make a deposit using the bonus code WELCOMEBONUS will be given 50 free spins on the Starburst slot. It is almost certain that players will win a decent amount of bonus cash with these spins and all they need to do is play through those winnings 10 times to cash out. PartyCasino doesn’t have a great selection of ongoing promotions at the moment but they have been known to run some good ones. It doesn’t matter if you are a first-time depositor or if you’ve been playing at PartyCasino since the beginning, there is usually an innovative promotion waiting for you to cash in on. Check your player profile to find out what offers are available to you. First time depositors have a shot at winning a $1,000 cash prize in PartyCasino’s Grand Giveaway draw. Players may opt in to collect draw tickets when they make their first deposit. You earn 5 tickets for every $20 you initially deposit and then an extra 2 tickets for each additional $20 deposit in the first month. A random draw will be held and the winner gets a sweet $1,000 cash prize. PartyCasino players are rewarded every time they place a bet with PartyCasino’s Cashback program. Once you have opted in, all wagers placed on jackpot slots will earn 0.50% cashback while slot wagers earn 0.25% cashback. Roulette wagers earn 0.25% and other table games such as Blackjack earn 0.10%. Players can track their progress and redeem their cash by referring to the “Cashback” section of their account. PartyCasino’s VIP program is by invite only but the site doesn’t just think about how much money you spend. They also consider how active you are. PartyCasino keeps a close watch on player activity and if they think you have what it takes, they will send you an invitation to this exclusive club. Being a VIP member entitles you to a lot of great benefits. All VIPs are assigned a personal account manager that is on hand to cater to your every need. Members can contact their account manager on weekdays between 08:00 and 17:00 GMT. VIP members are given special attention from the support team. Your VIP host is standing by 24/7 to offer you priority service. While regular members enjoy fast withdrawal times, VIP members’ withdrawals are processed even faster. One of the jobs a personal account manager has is making sure that their VIP clients are given special bonuses that are specifically tailored to meet their unique requirements. VIP members shouldn’t be surprised if they receive a no-deposit bonus, especially when they go through a winless streak. It might be your birthday or it could be some other special anniversary. Whatever the case, your account manager will know about it and help you celebrate the occasion by giving you a hand-picked gift. PartyCasino’s VIP team is always coming up with ways to entertain VIPs. They are constantly organizing exciting events such as trips to see Champions League football, Oktoberfest or VIP junkets to Las Vegas. PartyCasino extensive collection of games were created by some of the biggest and most reputable software developers on earth. Microgaming, Playtech, NetEnt, Yggdrasil, and Thunderstruck are some of the most recognizable names in casino gaming software and they combine with other heavyweights like Play’N Go, Blueprint, Evolution Gaming, and IGT to offer PartyCasino players one of the largest selections of titles anywhere. Games are categorized across the top of the main page for easy access. Go for a really big win by clicking on the “Jackpot Slots” tab near the top of the page. Piggy Pirates, Dragon’s Luck, Mayan Gods, and Tiki Fruits give players a chance to win serious money. Mega Moolah and Hall of Gods have produced many multi-millionaires. The leading software developers that feature their games at PartyCasino are constantly releasing new games to add to the site’s massive library of titles. You will always find several new releases such as Endless Treasure, Temple of Nudges, Book of Immortals, and many more when you click on the “New” tab. Try out some of the latest jackpot slots like Champagne Super Clover, Spin Town, and Tridentia. PartyCasino has hundreds of slot games ranging from classic three-reel slots to modern multi-reel slots. Wolf Gold, Legacy of Ra, Rumble Rhino, and Bonanza are among the most popular slots in the world and you can play them by selecting the “Slots” link. Play’N Go bonus slots, Yggdrasil Respin slots, and IGT free spin slots are just scratching the surface. There are also dozens of slot games that are exclusive to PartyCasino. Blackjack is so popular that it warrants its own special category. Infinite Blackjack, Premium Blackjack Pro, 3D Blackjack, and Blackjack Party are just a few of the Blackjack variants under the “Blackjack” tab. Roulette has been a casino mainstay since the 1700s and PartyCasino has plenty of Roulette titles to choose from. European Roulette, American Roulette, 3D Roulette, and Terminator Roulette are among the more popular variants while Speed Auto Roulette, Lightning Roulette, and Immersive Roulette also attract loads of players. Select the “Table Games” link to play classic table games like Roulette and Blackjack along with other casino classics including Craps, Baccarat, Pai Gow Poker, Super Wheel, and even video poker. PartyCasino offers the best of the best so it shouldn’t surprise anyone to learn that Evolution Gaming powers the live casino here. Professional dealers and croupiers are ready to take your bet no matter what time it is. Live Roulette, Live Blackjack, and Live Baccarat along with Three Card Poker, Live Dealer Hold’em, and Caribbean Stud offer players endless entertainment. Try your luck at Dream Catcher, Dragon Tiger, and Top Card. Do you like to play Slingo? Bingo? How about Golden Boot, King Kong Cash or Wheel of Fortune Winning Words? You can play all these games and dozens more in this section. No casino would be complete without a variety of video poker games. Bonus Poker, Jacks or Better, Triple Play Draw Poker, and Double Double Bonus Poker are a few of the video poker games that have yielded big payouts. PartyCasino wants to make it easy for their players to deposit and withdraw funds which is why they offer so many convenient payment methods. Players can make credit card deposits using Visa, MasterCard, Maestro, and Diners Club. Other accepted payment methods are Visa Electron, Paysafecard, Skrill, Skrill 1-Tap, Instadebit, Neteller, MuchBetter, Instant Banking, and Electronic Transfer. All of these methods require a $10 minimum deposit while EcoPayz deposits must be at least $25. A $20 minimum is required if you want to use iDebit. Depending on where you live, Abaqoos, Apple Pay, CashtoCode, eMoneySafe, GoPlay, EPS, Przelewy24, Trustly, and Sofort banking may be options. To deposit money into your PartyCasino account, log in and click on the red “Deposit” button. Select the payment method and then enter the amount you want to deposit. The funds should be in your betting account right after you confirm the transaction. Withdrawing funds is a quick and hassle-free process. Simply go to the banking section in your player profile and click on “Withdrawal”. Choose your preferred payment method and enter the amount to be cashed out. Confirm the withdrawal and the funds should be available to you soon. Players can withdraw using Visa, Visa Electron, Instadebit, Maestro, MuchBetter, Fast Bank Transfer, Electronic Transfer or Bank Wire Transfer. PartyCasino’s customer service staff is on standby 24/7/365 to assist you in any way they can. If you have any questions or concerns, you are urged to refer to the FAQ section but if you can’t find what you are looking for, then go ahead can get in touch with the support team by clicking on the “Contact Us” link. You can select the “Send Email” icon to send an email or click on “Live Help” to instantly get in touch with the support team. Another way to contact the customer care staff is by telephone. There is a drop-down menu that contains toll-free numbers for the UK, Canada, Germany, Russia and all other regions. 1. Are the games at PartyCasino fair? Any game you play at PartyCasino is guaranteed to be fair. Every single game has been thoroughly audited for fairness by leading third-party software testers like eCOGRA. 2. Is PartyCasino compatible with mobile devices? Absolutely. Players who use mobile devices can go to PartyCasino and instantly play their favorite games without downloading an app. However, you can go to Google Play to get your Android app or the App Store for the iOS app if you want to. Either way, the games are configured to work just as well on mobile devices as they do on desktops and laptops. 3. Can I set limits on my gambling activities? PartyCasino promotes a responsible gambling policy and they can help you curb your gambling a few different ways. You can limit your deposits, put a cap on your stakes, take a time out or even enter a period of self-exclusion. PartyCasino provides links to several organizations that are dedicated to helping problem gamblers. 4. Are there any restrictions on playing for real money? Any player who opens an account at PartyCasino must be at least 18 years old and legally eligible to gamble online in their region. Unfortunately, players from certain countries are not allowed to open a PartyCasino account. A list of excluded countries is found in the terms and conditions section. 5. Do I need to verify my age and identity? You must verify your age and identity before you are eligible to withdraw any funds from your account. This process is required to prevent underage gambling, fraud, and money laundering. You can verify your age and identity by going to the document upload page and submitting copies of a government-issued ID along with a utility bill, bank statement or void check. PartyCasino has the right to ask for additional documentation. Copyright © 2019 PokerForums.org, All Rights Reserved | Affiliate WordPress Themes from Flytonic.